1) This paper was presented at the FIG Working Week, 6-10 May 2013 in Abuja, Nigeria. This paper explores how, with only a small amount of investment, the development and implementation of internationally agreed and recognised measurement standards will support an improved market efficiency and providing a wide range of beneficial tools to decision makers. Key words: International Measurement Standards, Land Rights, Real Estate, Land Administration and Management, RICS. This paper explores how, with only a small amount of investment, the development and implementation of internationally agreed and recognised measurement standards will support an improved market efficiency, providing a wide range of beneficial tools to decision makers - from benchmarking pricing of developments to the identification and valuation of ownership collateral for the poorest in our societies to an increased fiscal/tax raising potential from the establishment of a formalised land and property market (fiscal cadastre). A properly functioning, transparent and sustainable market in land, property and construction is a fundamental building block of any successful economy. The elements of such a market range from registration of enforcement of land title, to accurate asset valuations prepared in accordance with International Valuation Standards, to an adequate supply of professionals working to common ethical principles. One key missing ingredient that needs further attention at a global level is a set of standards for the physical measurement of land and buildings. RICS believes that the creation and establishment of International Measurement Standards are an essential part of the process to spatially enable land administration and management. The open market is the primary vehicle for the allocation of scarce resources amongst competing needs in almost all economies in the World, it is beholden on all civilised societies to recognise and take steps to eliminate or reduce market inefficiencies where and when they occur. “Market efficiency in economic terms occurs when the marginal cost equals marginal utility in every market. Resources are inefficiently allocated when marginal cost differs from marginal utility” (Lipsey & Harbury, 1988, p. 102). This paper addresses one of the key areas of market inefficiency, that of market knowledge. “The efficiency of markets is reduced by imperfect knowledge” (Harvey & Jowsey, 2004, p.29). Many mature economies have expended enormous energy and investment on providing knowledge to markets in a variety of forms. The World Bank estimates that “land and real estate assets comprise 50-70% of the national wealth of the world’s economies” (LARA, January 19, 2000). This being the case, even the smallest improvement in land market efficiency will generate a significant beneficial effect to that economy. The Royal Institution of Chartered Surveyors (RICS) objectives are “to maintain and promote the usefulness of the profession for the public advantage in the United Kingdom and in other parts of the world” and “securing the optimal use of land and its associated resources to meet social and economic needs” and “measuring and delineating the physical features of the Earth” (RICS Thought Leadership, 2012, p. 7). “How we value land, and the services it provides, is at the heart of decisions on land use change. As priorities for land use and land management shift (for example, to reflect long-term challenges identified in this report) these need to reflected in how we govern land use today.” The report goes on to call for “A more sophisticated approach to valuing land…to be embedded into policy cycles and into the governance mechanisms, including future incentives and regulation…The appropriate concept of value” is seen as “a broad one, encompassing the full range of ecosystem services, whether or not they are marketed” (p. 28). RICS has also explained (in the UK context) the often critical issue of ‘land value’ and its calculation and its direct effects on development viability in the 2012 best practice guidance ‘Financial Viability in Planning’ (RICS, 2012, p. 23). Peter Drucker (2009), a management consultant, famously once said; “If you can't measure something, you can't manage it.” It equally follows that if we use different measurement systems there is management time taken in processing comparability and risk that the comparability is flawed. Measurement is thus a fundamental ingredient of estimating a value and a valuation is a fundamental means of decision-making through the market mechanism. Equally it is for ‘what purpose/why’ we measure that leads directly to ‘what’ we measure and then to the ‘how’ we measure. RICS have undertaken primary and secondary research into the area of real estate measurement and its global application. The research reveals the absence of international standards for measurement of real estate, furthermore measurement standards tend to vary on both a national and regional basis. Certain elements of ‘measurement’ such as geodesy do tend to be globally applicable and have a consistency in their academic provision (http://www.iag-aig.org/) and the International Organization for Standardization (www.iso.org) have created numerous internationally agreed standards on ‘measurement’ instrumentation use, checking and calibration (TC172) and on geographic information/geomatics (TC211). Yet without internationally agreed measurement standards, it is not possible to have valid and authentic cross border comparison, which would facilitate both the evaluation and decision making process for land administration and management. Land use planning, management, and taxation. Public provision of land information. Dispute resolution and conflict management” (p. 2). An agreed international measurement standard would help bring transparency to each theme and would “allow follow-up measurement” and “contribute to substantive harmonisation and coordination” (LGAF, 2012, p. 21). In many countries, land rights could be strengthened through an agreed international measurement standard that would allow more accurate quantification to enable better coordinated spatial planning and land management through increased land information quality that would make service delivery more transparent. In respect of the five broad areas currently being investigated as part of the World Bank Agriculture and Rural Research Program, productivity has to be measured by an internationally recognised measurement standard before you can discuss raising productivity in rural areas or analysing productivity growth in poor countries. Public goods and externalities, which comprise the two sub categories of rural infrastructure and community-based development, would require detailed measurement to investigate the current situation and measure progress. Finally, analysis of agriculture, trade and the environment, volatility, and price distortions would require measurement, but to what measurement standard? Would we need to be innovative or could we agree an existing standard? Innovative approaches can take many forms. They can involve, for example, creating new solutions for old issues such as defining natural value (a collaborative project currently being undertaken by RICS Land Group) or looking at old issues in new ways. Trying to spatially enable land administration and management without agreeing internationally recognised measurement is a bit a like putting the cart before the horse as each country/government would choose their measurement basis on the results they could attain, be it a measurement of productivity, growth or poverty. The Land Government Assessment Framework is built around five main areas for policy intervention: rights recognition and enforcement; land use planning, land management, taxation, management of public land, public provision of land information and dispute resolution and conflict management. International Measurement Standards fit into all these areas. For example, in order to have effective land use planning, land management and taxation you first of all need to measure the land, map the topography (as dictated in previous decades by ‘sale’ and cartographic generalisation), and calculate the productivity in order to have effective taxation. The same applies to management of public land or the public provision of land information. Even rights recognition and enforcement or dispute resolution would need some degree of quantification and measurement in order to reach a successful resolution. RICS is currently working with a number of organisations to achieve international dispute resolution standards, which would also assist in this process. In respect of agricultural growth and productivity, which investigates the role markets, risk and policy play in determining rural livelihood strategies and the adoption of agricultural technologies and the consequences of these outcomes for productivity and rural incomes, measurement play a vital part. Yet impact and adaptation to climate change, which focuses on the poverty impact of changing climate volatility in Southern and Eastern Africa, would not be possible without some agreed basis of International Measurement Standards. Moreover if we consider distortions to agricultural incentives, true measurement of the crops produced by the farmer and of the price deviations prevalent in the local and international market, it would go some way towards understanding and dealing with these very real issues and would also help countries properly monetise their agricultural assets and grow economically. Land administration functions can be divided into four main components: Juridical, regulatory, fiscal and information management. Agreed principles based standards would aid the accurate establishment of land rights and related security of tenure, which would allow the regulatory side to operate more efficiently as accurate measurement is a vital component of both fiscal and information management. The functions of land administration comprising agencies responsible for surveying and mapping, land registration and land valuation evidently include measurement, but to what standard and in which jurisdiction? Even though International Measurement Standards cannot be underestimated as an essential building block to spatially enable land administration and management it is also necessary to be cognisant of the local measurement standards. In some cases, a dual standard of measurement could be preferable with locals measuring according to both local standards and units of measurement and to an internationally agreed standard. The presence of dual systems can mirror that of a ‘formal’ and an ‘informal’ (but fully functioning market). Further work in the UK in 2005 found that “13% of the UK’s economic growth between 1948 and 2002 could be attributed to standards.” (DTI, 2005). “Land tenure: Securing and transferring rights in land and natural resources. Land value: Valuation and taxation of land and properties. Land use: Planning and control of the use of land and natural resources. Land development: Implementing utilities, infrastructure, construction planning and schemes for renewal and change of existing land use” (UN- Habitat, IIRR, GLTN, 2012, p.3). All these categories have some form of measurement running through their core. You cannot secure and transfer rights in land and natural resources in a fair and equitable manner without an agreed method of quantification. Measurement is a vital constituent of any valuation and also forms the basis of a number of underlying assumptions in respect of estimated rental values and anticipated growth. In respect of land use planning and control, productivity cannot be measured without initially measuring the size, topography and scope of land in the first place. Finally development is underpinned by measurement at every stage from pre-implementation to post construction, whether it is utilities, infrastructure, renewal or change of use. Support of governance and the rule of law. Support for formal land markets. Support for land and property taxation. Improvement of land use planning and implementation. Improvement of infrastructure for human settlements. The GLTN see the responsibility of administering land as the task of a range of “informal and formal institutions including government, private and non-governments actors.” It goes on to state “unfortunately conventional government land administration systems do not provide security of tenure to the majority of the world’s people. They rely on documents or computerised systems that record information…but most people do not have legal documents for the land they use or occupy….and limited land records and lack of information cause dysfunctionalities in the management of urban and rural areas, from the household up to national government level, which impairs the lives of billions of people” (UN-Habitat, IIRR, GLTN, 2012, p. 4). The work of GLTN and UN-Habitat is also directly connected to the land rights continuum (as below) and embedded in the recently published Land Administration Domain Model (LADM) international standard from FIG and ISO. If we look at the Property Lifecycle chart below (Figure 2), it becomes clear that measurement is a key aspect of this lifecycle. Not only does land need measurement, but also accurate measurements are required as part of every stage of the process even including eventual redevelopment of the property, where measurement is once again necessary. If we look at some less developed countries, large parcels of land are not even measured, let alone registered and the creation of an agreed international measurement standard would be the first step towards enabling land administration and management. From an economic perspective through land registration, there will be improved land and asset values, security of tenure, as people will be able to prove and pass on ownership. This in turn would help to stimulate local investment and therefore the local economy. Further research into land registration has been carried out on this topic in the RICS research paper on the ‘Valuation of Unregistered Land’ (2013). The development of International Measurement Standards is perhaps the most vital land tool to take the first steps in contributing to poverty reduction and sustainable development through promoting secure land and property rights for all. As part of the development of these standards one must recognise that “land issues are notoriously complicated and they involve extensive vested interests. To design land tools that are pro-poor, gender responsive and usable at scale requires inputs from various disciplines, professions and stakeholder groups. The land tools must be applied across different fields. That means the inputs from the various specializations must be integrated, not merely co-existing in ‘silos. For this reason, land tools are best developed by multi-disciplinary teams. This requires openness both to the content and to new ways of working so that different views can be accommodated” (UN-Habitat, IIRR, GLTN, 2012, p. 14). There are currently an infinite number of competing international and national measurement standards not only within the real estate industry, but also across other fields and specialisms. These measurement standards are often subject to national variance and regional interpretation, although measurement underpins all valuation and accounting. The globally accepted standards for asset and liability valuation, which includes all forms of land, property and real estate, are the International Valuation Standards 2011 (IVS, 2011). IVS 2011 defines basis of value as “a statement of the fundamental measurement assumptions of a valuation” (IVS, 2011, p. 11), yet there is no definition of measurement within these standards, even though some form of measurement underpins not only valuations, but also the underlying assumptions for these valuations. The measurements are subject to national variation making it extremely difficult to have true comparison of land valuations without knowing all the national bases and deconstructing them in such a manner to make a common form of comparison possible. In some countries, such as India, the situation is further complicated by regional variations of measurement standards. This situation could be resolved through the creation of international measurement standards, which could initially work in tandem with the existing national standards. In creating these standards it would be possible to compare land values, productivity, performance and it could be argued that these standards could act as a fundamental land tool or cornerstone to spatially enabling land administration and management. The RICS Valuation – Professional Standards (Red Book) are compliant with IVS 2011 and also make several mentions of measurement. The Red Book definition gives slightly more detail to the definition of basis of value, which it defines as “a statement of the fundamental measurement assumptions of a valuation, and for many common valuation purposes these standards stipulate the basis (or bases) of value that is appropriate” (RICS, 2012, p. 29), yet still falls silent on the issue of defining the fundamental measurement assumptions, on which these valuations are based. This is despite the fact that the Red Book also mentions the measurements of the relevant land, the measurements of any such buildings and the number of rooms in any such buildings and their measurements. Though both the IVS and Red book are purposely set at a high level and are prescriptive, providing the rules of valuation without telling its practitioners how to value, a definition of these fundamental principles of measurement is vital to bring further transparency to the real estate industry. Unfortunately at an international level this is still not possible, as no agreed International Measurement Standard currently exists. Both these valuation standards are compliant with International Financial Reporting Standards (IFRS) as valuations are required for different accounting purposes in the preparation of the financial reports or statements of companies and other entities. Examples of different accounting purposes include measurement of the value of an asset or liability for inclusion on the statement of financial position, allocation of the purchase price of an acquired business, impairment testing, lease classification and valuation inputs to the calculation of depreciation charges in the profit and loss account. IFRS were developed by the International Financial Reporting Standard Foundation working in conjunction with the International Accounting Standards Board (IASB). The goal of the IFRS Foundation and the IASB is to develop, in the public interest, a single set of high quality, understandable, enforceable and globally accepted financial reporting standards based upon clearly articulated principles. In pursuit of this goal, the IASB works in close cooperation with stakeholders around the world, including investors, national standard-setters, regulators, auditors, academics, and others who have an interest in the development of high-quality global standards. Progress towards this goal has been steady. All major economies have established time lines to converge with or adopt IFRSs in the near future. The international convergence efforts of the organisation are also supported by the Group of 20 Leaders (G20) who, at their September 2009 meeting in Pittsburgh, US, called on international accounting bodies to redouble their efforts to achieve this objective within the context of their independent standard-setting process. In particular, they asked the IASB and the US FASB to complete their convergence project. In order for Land Administration and Management to be truly global in thinking and analysis, International Measurement Standards are required for transparency and for more valid and authentic cross border comparison and regulation. It is for this reason that we are advocating the creation and promotion of a unified set of International Measurement Standards, which can be agreed upon and supported by multiple organisations and professional bodies, as is the case with the IFRS. There is clear evidence that in many nations, the process of the efficient and effective working of the property market is inhibited by imperfections in the quality and transparency of property market information. The imperfections are normally a consequence of the technical attributes of the property market including transaction size, heterogeneity, property rights and transaction costs. Through development and adoption of truly international standards, we can address market imperfections, and provide information based on the highest ethical and professional standards that improve resource allocation within the market for the public good. In order to be meaningful, international principle-based standards need to be developed by experts and be subject to broad and open international consultation and stakeholder review in order to reassure society and the international marketplace of the level of service they can expect. International standards are drafted in such a way as to allow professional bodies, and other appropriate organisations, to assess conformity to the requirements. How do we develop these International Measurement Standards and what processes should we use? David Andre Singer’s book (2010) on Regulating Standards looks at the way international standards were set for the International Financial System. The book researches global regulation in the three traditional pillars of finance; banking, securities and insurance. Singer demonstrates that through “international regulatory harmonisation regulators can impose sufficiently stringent regulations on domestic financial institutions – and shore up stability while relaxing the international competitive constraint that normally prohibits such costly tightening”. He describes regulators as the “new diplomats” due to their increasing visibility on the international scene and says in some cases “the creation of international standards ties the hands of a regulator by limiting its ability to adjust to changing domestic or international circumstances” (Singer, 2010, pp. 2-3). In reality, no regulator would accede to an international standard without carefully considering its domestic environment. In fact Anne-Marie Slaughter (2004), who is the University Professor of Politics and International Affairs at Princeton University, makes the point that “legislators lag far behind regulatory agencies in their international activities and remain rather parochial in their outlook” (as cited in Singer, 2010, p.7). The International Financial System has much symmetry with the real estate industry, apart from the direct connections that both “IVS 2001” and the “Red Book” are IFRS compliant. Just as with land administration and management, at the heart of any financial system is the problem of asymmetric information, in which one party has more (and more accurate) information about its own status than another party. Singer (2010) argues that in respect of regulation the political legislature will intervene in the financial sector in one of two circumstances: “First, a bout of financial instability characterised by firm failures, asset price volatility, or general crisis of confidence will create enormous pressure to intervene. Second from the financial sector itself by creating incentives for legislative intervention when regulations are deemed too onerous compared to those in foreign jurisdictions” (p. 22). In respect of real estate and measurement, there is a real danger of political intervention on a national level unless professionals show the ability to regulate themselves through the creation of an International Measurement Standard. At present the way we measure property varies from country to country. This leads to significant discrepancies in reporting in an industry that, these days, is defined more by global financial-return than location. Singer (2010) argues that there are three main types of harmonisation. “The first regulatory convergence is the organic process but which countries modify their regulations based on the policies of other countries or simply converge on a common set of rules inadvertently. The second type of harmonisation is called core harmonisation and is the process where a small group of advanced industrialised countries agree, through overt negotiation, to harmonize their regulation. The result of successful core harmonisation is an international standard. The creation of an international standard gives rise to the third type of harmonisation, peripheral harmonisation, in which countries outside the core group of industrialized countries choose whether to accede to the standard or to maintain divergent standards” ( p. 122). Although in accord with the three main types of harmonisation mentioned here, a fourth type of harmonisation that is becoming increasingly prevalent today is known as forced harmonisation. If we look at the recent major global recession, we could argue that it was characterised by various systemic imbalances, which sparked the outbreak of the financial crisis of 2007–2008. We could highlight a number of markets where these systematic imbalances were present such as the sub prime mortgage crisis with Fannie Mae and Freddie Mac. The US Securities and Exchange Commission are a federal agency, they hold primary responsibility for enforcing the federal securities laws and regulating the securities industry. The nation's stock and options exchanges, and other electronic securities markets in the United States, responded to these crises by enforcing further regulation within these markets. Paul Beswick, who is the Deputy Chief Accountant, US Securities and Exchange Commission made the following comments in his speech on December 5, 2011 in respect of real estate valuation “Risks created by the differences in valuation credentials that exist today range from the seemingly innocuous concerns of market confusion and an identity void for the profession to the more overt concerns of objectivity of the valuator and analytical inconsistency.” (Beswick, 2011, p. 4). His speech highlights two main issues. The first is if the real estate and those dealing with the real estate do not take the first steps to regulate themselves, then external regulation will come through other bodies, who may not fully comprehend the complexities and checks and balances that lie within the real estate industry and the industry would lose some of its right to self determination and regulation. The second main and perhaps more important issue is that market confusion and analytical inconsistencies are currently embedded within the real estate industry. This is true of all specialisms and equally applicable to land administration and management. Another way of solving market confusion and analytical inconsistencies within both the real estate industry in general and more specifically within land administration and management would be the creation of International Measurement Standards. Measurement relates to all aspects of the real estate industry and in the majority of cases is the vital first block on which the foundations are built, whether it be land tenure, land use, land value or land development. “If there were no international trade and no international communications, international standards would hardly be necessary! But international trade and communications are imperatives, especially in modern times.” (Hunter, 2009, p. 75). The required support for approval as an International Standard cannot be obtained. There is doubt on whether consensus has been achieved. The subject matter is still under technical development. There is another reason precluding immediate publication as an International Standard” (ISO/IEC Directives, Part 2, 2011, p. 9). Classical Methods (also called traditional or formal methods). Internet Engineering Task Force (IETF) methods. He states, “these methods should not be considered to be mutually exclusive. Many important standards development projects involve more than one of these approaches” (Hunter, 2009, p. 51). RICS have explored the processes for developing standards and consider classical methods for standards adoption too laborious and prescriptive at times, especially when there is an immediate need for measurement standards in many parts of the developing world. RICS is in the process of establishing a quasi coalition for the creation of international measurement standards - to achieve a goal that none of the individual organisations can achieve on its own. Standard setting consortia, apart from bodies such as IEC and ISO (founded in 1906 and 1947 respectively) are a recent development and the “motivation for the establishment of such consortia and the relatively long time it frequently takes for standard development organisations to develop a standard. Consortia are frequently able to set a standard in a relatively short time” (Hunter, 2009, pp. 59-60). A good example of this type of consortia is the Open Geospatial Consortium (OGC http://www.opengeospatial.org/standards/is). We need to ensure the international standard that we create is globally relevant and beneficial. The World Trade Organisation (WTO) looked at this issue in the committee on Technical Barriers to Trade Document commented on this in Part IX, paragraph D, Effectiveness and Relevance, which states: “In order to serve the interests of the WTO membership in facilitating international trade and preventing unnecessary trade barriers, international standards need to be relevant and to effectively respond to regulatory and market needs, as well as scientific and technological developments in various countries. They should not distort the innovation and technological developments in various countries. They should not distort the global market, have adverse effects on fair competition, or stifle innovation and technological development. In addition they should not give preference to the characteristics or requirements of specific countries or regions when different needs or interests exist in other countries or regions. Whenever possible international standards should be performance based rather than based on design or specific characteristics.” (WTO, 2002, p. 26). The creation of a global consortium headed by organisations such as the World Bank would help ensure that the resulting International Measurement Standard would be globally relevant and facilitate international national trade while preventing unnecessary trade barriers. It would also ensure that the resulting standards are not partisan to any particular country or organisation and that they are relevant and effectively respond to market needs without distorting the global market or adversely effecting fair competition. Finally and most important of all it would ensure that the resultant standards would serve the global public interest. The International Bank for Reconstruction and Development (IBRD) and the International Development Association (IDA) both form part of the larger body known as the World Bank Group. The IBRD aims to reduce poverty in middle-income and creditworthy poorer countries, while IDA focuses exclusively on the world’s poorest countries. Both these aims can be furthered through the creation of an International Measurement Standard that would ensure fair and effective global land registration that would encourage increased international investment. Accordingly, an effective land management and registration system cannot occur without an agreed system for quantification. Stage 1: The stage at which the decision to develop a standard has been made. Stage 2: The stage at which technical work has begun but for which the period of comments has not yet started. Stage 3. The stage at which the comment period has started but has not yet been completed. Stage 4: The stage at which the period for the submission of comments has been completed, but the standard has not yet been adopted. Stage 5: The stage at which the standard has been adopted. In some cases it may also be possible to adopt a fast track procedure. If a document with a certain degree of maturity is available at the start of a standardisation project, for example a standard developed by another organization, it is possible to omit certain stages. In the so-called ‘Fast-track procedure’, a document is submitted directly for approval as a draft International Standard or, if the document has been developed by an international standardizing body recognised by the consortium, as a final draft International Standard without passing through the previous stages. Subsequently the ISO have their international standards developed by ISO technical committees (TC) and subcommittees (SC) by the following six-step process. Those most commonly related to surveying and measurement activities are within TC211, TC172, and TC59. Once the final draft International Standard has been approved, only minor editorial changes, if and where necessary, are introduced into the final text. The final text is sent to the ISO Central Secretariat, which publishes the International Standard. In some cases it may also be possible to adopt a fast track procedure. If a document with a certain degree of maturity is available at the start of a standardisation project, for example a standard developed by another organization, it is possible to omit certain stages. In respect of an International Measurement Standard, RICS is currently at Stage 1 or the proposal stage. RICS has identified a number of stakeholder coalition partners from all the world regions, who have identified the global need for international standards and who are having an initial stakeholder meeting to discuss and agree the processes for the creation of an International Measurement Standard. Initially the RICS are focussing on international property measurement standards comprising Land, Property and Construction. It is hoped that once the impetus is created through the establishment of these standards the consortium will widen the remit of measurement and also look at measurement of Productivity and Productivity Growth, Agricultural Production, Trade (Surplus and Deficits), Environment (Sustainability), Poverty (GDP, PE ratios etc. ), Embodied Carbon and Profitability (ratios and absolute measures). These forms of measurement will also assist in spatially enabling land administration and management, but in order to apply these international standards and as effectively as possible it is necessary first of all to focus on one aspect of measurement. RICS has decided that in order to develop International Measurement Standards, it should initially look at International Property Measurement Standards with Property being defined as anything pertaining to Land, Property and Construction. RICS research has shown that with the exception of organisations such as the World Bank, there is no organisation or professional body that deals with measurement in all its form and even within the Property/Real Estate Industry there is limited agreement within, let alone across disciplines. In addition to current codes or standards used nationally (or regionally), a standard international code of measurement would be a tool for the consistent reporting of building areas (commercial space) by surveyors and companies that work across borders and market practices. For those working in emerging markets or countries (regions) here there is currently no code or standard in use; an international code of measurement may form the basis of, and help to establish, some standard form of measurement standard. The study looked at the RICS Code of Measuring Practice, Draft European Measuring Practice, UGEB Code and BACS Code in Belgium, The standard for calculating the Rentable Value of Commercial Premises (GIF) in Germany, The Code of Measuring Practice for Spain, NEN 258 in the Netherlands, Method Of Measurement by the Property Council of Australia, the USA Unified Approach for Measuring Office Space: For use in Facility and Property Management, The USA BOMA Office Space Standard 2010, Measuring Practice Guidance Notes for Ireland, Code of Measuring Practice or Hong Kong and the Code of Measuring Practice for the United Arab Emirates. RICS also produces numerous other measurement orientated best practice guidance documents such as ‘Surveys of land, buildings and utilities at scales of 1:500 and larger 2nd Ed 1997’, ‘Use of GNSS in surveying and mapping 2010 2nd Ed’ and ‘Vertical aerial photography and derived digital imagery 5th Ed 2010’. In examining these existing standards, a chart was made of all the similarities in respect of office measurement to see if any common ground could be found. Though there was some common ground between the different codes, it proved highly difficult to reach an agreement, as each country was convinced of the merits of its own code and felt that other organisations or professional bodies should adopt its standards rather than adopting other organisations’ standards or creating new standards. In analysing the difficulties we had in respect of this project it was noted that one of the main issues was that we had in establishing an agreed standard is that we started from the micro level (i.e. the actual standards) and tried to find a point of resolution. A better process, as shown by both psychological and mediation theories, is to start from a point of agreement. Discussing and agreeing the importance of measurement and exploring the fundamental principles by which all forms of measurement must abide could initiate the process. RICS has carried out multi-disciplinary research to examine the fundamental principles that lie behind a number of specialisms, all of which use some form of measurement. The research looked at the following disciplines: administration and support service activities, archaeology, construction, education, engineering, financial and insurance activities, home health and social work activities, land geomatics, manufacturing, mining and quarrying, physics, professional scientific and technical activities, water supply, transportation and storage and waste management and remediation activities. The majority of these disciplines had numerous measurement and other standards within their disciplines but no real fundamental principles that lay behind them. In addition as with real estate there were a number of competing professional bodies, on both a regional and national basis, each with their own standards. The exceptions to these were construction, engineering and physics. In respect of construction, as with other disciplines, measurement seems to be largely based on national lines with wide variations in terms of what is measured and how this is done. In respect of housing measurement in the USA, the following principle exists in respect of the measurement of residential square footage in single family dwellings: “In the calculation, the objective must be to measure accurately, calculate competently, and identify the improvements in a manner that is not misleading and describes and/or facilitates an understanding of the property.” (Hampton Thomas, 2008, p. 12) In the case of engineering the value of consistent and valid measurement of such properties has led to the development of standard test methods, i.e., “standards”. Standards specify measurement details such as specimen design, test apparatus and calibration, test procedures, data reporting, limits of applicability, and uncertainty. The standards are usually up-dated with significant contribution and review by the technical community concerned. International standards are generally developed through the cooperative efforts of national or regional standards organisations and reflect the methods developed for those bodies’ standards. Use the right measurement tools. Use the right measurement procedures. Use the right people to do the measurement. Demonstrate how consistent the measurement is. There must be a unit of measurement. The measurement must be quantifiable. The measurement must be repeatable. The measurement must be comparable against other similar forms of measurement. The measurement must be objectively verified. The basis of measurement must be agreed. The standard or unit of measurement must be agreed. The measurement must be transparent. The measurement tolerance must be agreed. Though International Measurement Standards that deal with all forms of measurement as outlined above do not currently exist, it would be possible to create both these standards and agree the fundamental principles of measurement by working collaboratively with the World Bank and other international and national, Governmental and Non-Governmental bodies and professional bodies and organisations. In order to achieve International Measurement Standards, RICS is gathering the leading international stakeholders in measurement (of all asset classes) at a round-table discussion to address existing fragmentation and assist in the resolution of this industry wide issue. The agreement of these standards would play a vital role in spatially enabling land administration and management. Initially RICS is focussing on broad based real estate measurement standards, which are applicable to all asset classes. Examples of these types of real estate measurement standards are site area/land area/plot area/development area, all of which are vital to effective land registration and administration. We can then continue to work collaboratively with other stakeholders in order to agree further International Measurement Standards by updating existing standards, negotiating agreed standards, adopting existing standards and agreeing high-level standards with other professional bodies. This will not mean the disappearance of national standards as in many cases national standards need to exist due to local government legislation and it may not be possible to agree an international standard. In these cases it would be possible to agree a dual reporting system, where the countries report their measurements according to both an agreed international and the appropriate national measurement standard. RICS believes the creation of International Measurement Standards would be a vital tool for all five broad areas currently being investigated by the World Bank Agriculture and Rural Research Program. Raising productivity in rural areas, productivity growth in poor countries, public goods and externalities, agriculture trade and the environment and poverty and price distortions all require measurement, but to which standard? If an agreed International Measurement Standards is not used, the temptation would be to pick the measurement standards that gave the best results and the best impression of the government and its policies. If this where the case any reported figures would be discoloured at best. In addition as illustrated four of the five main areas for policy intervention within the Land Government Assessment Frameworks (i.e. rights recognition and enforcement, land use planning, land management and taxation, management of public land and provision of public land) are all related to measurement in some way and would benefit from an agreed International Measurement Standard. In fact it could be argued that measurement of land would be a vital and fundamental component of the land rights recognition process. Moreover the five broad thematic areas, that have been identified and discussed in this paper as major areas for policy intervention, would substantially benefit from an agreed International Measurement Standard. This would help bring transparency to each thematic and “would allow follow-up measurement” and contribute to substantive harmonisation and coordination” (LGAF, 2012, p. 21). As already mentioned Global Land Tool Networks (GLTN) research, which looks at innovative tools of land management and secure tenure, divides land management and administration into the following four categories: Land tenure, land value, land use and land development. All these categories have measurement running through their core, yet there is no agreed International Measurement Standard which focuses on the why, what and how of measurement that would allow cross border comparison. Furthermore in many countries there is not even a national measurement standard, which would allow comparison between states. 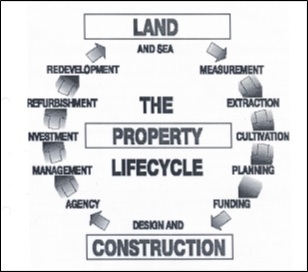 The RICS Property Lifecycle Diagram (Figure 2) contained within this paper further illustrates this point. In fact it could be argued that the development of International Measurement Standards is perhaps the most vital land tool to take the first steps in contributing to poverty reduction and sustainable development through promoting secure land and property rights for all via accurate quantification. In our examination of the relationship between International Financial Reporting Standards and International Valuation Standards (IVS 2011) and the RICS Valuation – Professional Standards (The Red Book) we have noted that though these standards define the basis of value as “a statement of the fundamental measurement assumptions of a valuation” (IVS, 2011, p. 11), none of these standards defines either measurement or the basis of this measurement. There is clearly a need for an International Measurement Standard to spatially enable land administration and management. Through exploring the methodology for creating international standards and looking at examples of standard setting within the accounting, engineering and financial regulations industry RICS has concluded that the best process for establishing an International Measurement Standard is via the creation of a consortia or coalition partnership. Our preliminary research into office measurement standards illustrate the variety of measurement standards that are currently available within each specialist niche of the real estate industry and the difficulties that this can create in respect of agreeing an international standard. Our research has led us to conclude that in order to create an International Measurement Standard, which will spatially enable land administration and management we need to agree the fundamental principles on which all measurements are based, rather than getting embroiled in each countries or organisations particular standard. RICS has therefore carried out a cross specialism research on the fundamental principles that lie behind measurement and has discovered that at this point in time the most relevant fundamental principles that could be applied to measurement come from the field of physics. We have therefore analysed these principles of measurement and drafted a set of fundamental principles, which could apply to land administration, management and the real estate industry as a whole. In conclusion, the creation of internationally recognised measurement standards would help bring transparency to the field of land governance and would be a key stepping stone for the research currently being carried out by non governmental organisations such as the World Bank Agriculture and Rural Research Program, which examines the following areas; raising productivity in rural areas, productivity growth in poor countries, public goods and externalities, agriculture, trade and the environment and poverty, volatility, and price distortions. We would therefore like to invite FIG and other organisations attending the FIG working week 2013 to collaborate on international measurement standards as part of an innovative approach towards spatially enabling land administration and management. Beswick, P. A. (2012). Prepared remarks for the 2011 AICPA national conference on current SEC and PCAOB developments. USA: Securities and Exchange Commission. CIMA. (2005). International financial reporting standards in depth: Volume 1 Theory and Practice. Great Britain: Elsevier and CIMA. CIMA. (2005). International financial reporting standards in depth: Volume 2 Solutions. Great Britain: Elsevier and CIMA. Deininger, K., Selod, H. and Burns, A. (2012) The Land Governance Assessment Framework: Identifying and monitoring good practice in the land sector. Washington DC, USA: The World Bank. DTI. (2005). The Empirical Economics of Standards. www.dti.gov.uk/iese/The_Empirical_Economics_of_Standards.pdf. Drucker, P. (2009). “If you can’t measure it, you can’t manage it.”. http://blog.marketculture.com/2009/03/20/if-you-cant-measure-it-you-cant-manage-it-peter-drucker/. Government Office for Science. (2010). Foresight land use futures project. London, Great Britain: Government Office for Science. Harvey, J. & Jowsey, E. (2004). Urban Land economics 6th edition. Great Britain: Palgrave Macmillan Limited. Hampton Thomas, D. (2008). American Measurement Standard. USA: Measure Man. Hunter, R. D. (2009). Standards, Conformity, Assessment and Accreditation for Engineers. New York, USA: Taylor & Francis Group. International Valuation Standards Council. (2011). International valuation standards 2011. Norwich, Great Britain: Page Bros.
ISO/IEC. (2011). ISO/IEC Directives Part 2: Rules for the structure and drafting of International Standards. Geneva, Switzerland: ISO. Lipsey, R. & Harbury, C. (1988). Principles of Economics. Great Britain: Oxford University Press. RICS Thought Leadership. (2012). Challenges for international professional practice: From market value to natural value. Great Britain: Direct Approach. RICS. (2012). RICS valuation: Professional standards. Great Britain: Page Bros.
RICS Professional Guidance. (2012). Financial viability in planning. Great Britain: Page Bros.
RICS. (2007) Surveying sustainability: A short guide for the property professional. Great Britain: AccessPlus. Singer, D. A. (2010). Regulating capital: Setting Standards for the International Financial System. USA: Cornell University Press. UNHabitat, IIRR, GLTN. (2012). Handling Land: Innovative tools for land governance and secure tenure. Nairobi, Kenya: Publishing Services Section. ISO. (2012). Land Administration Domain Model (LADM). Switzerland, Geneva: ISO Publishing. RICS. (2012). Sustainability and the RICS Property Lifecycle. Great Britain: Page Bros. Qualified as a Chartered Building Surveyor, and practicising as a surveyor and arbitrator for 29 years. Qualified as both an arbitrator and loss adjuster additionally. Highlight of a varied career was the landmark House of Lords case of Delaware Mansions (Flecksun Ltd) –v- City of Westminster. Gary commenced his interest in surveying at the age of 14 when he undertook an O-level in surveying, subsequently pursuing this interest in surveying with a building surveying degree at University of Reading. On graduation in 1980, he went to work for the PSA (DOE) where he qualified as well as gaining experience on MOD and Civil Estate buildings. Moving to London in 1984, he became a Partner in Filby McCann & Bracken a chartered building surveying practice and then moved to Crawford & Co to become Surveying Director of a large international company with over 10,000 staff. For 10 years he was Subsidence & Surveying Services Director at GAB Robins a large multi-disciplinary international organisation prior to joining RICS in 2007 as Director of Practice Standards & Technical Guidance heading up Professional Groups & Forums. Gary is a member of the Senior Management Group at RICS and is a regular spokesman & conference speaker on built environment issues.